The turkey vulture nest gets visitors from time to time. An occasional nuthatch or raccoon as seen in Night Visitor pass through. This week, wood ducks have been landing on and peering into the cavity of the turkey vulture nest. Much to my surprise, a brave hen decided to leap inside. This entry was posted in My Backyard, Nature, Nature Art, Photography, Turkey Vultures and tagged GoPro, Mary A Livingston, No Place for UGLY Birds, turkey vulture nest, wood duck by MaryALivingston. Bookmark the permalink. What a cool project with lots to entertain your readers. You’re so handy and so creative! Thanks for sharing your backyard dramas. Funny the things that bring bliss! I am so enjoying the vultures this year. Thanks. We have a live feed set up on the entrance to the vulture nest. Trying to figure out how to have the live feed inside, perhaps next season. I was shocked when the wood duck dove in the nest cavity. 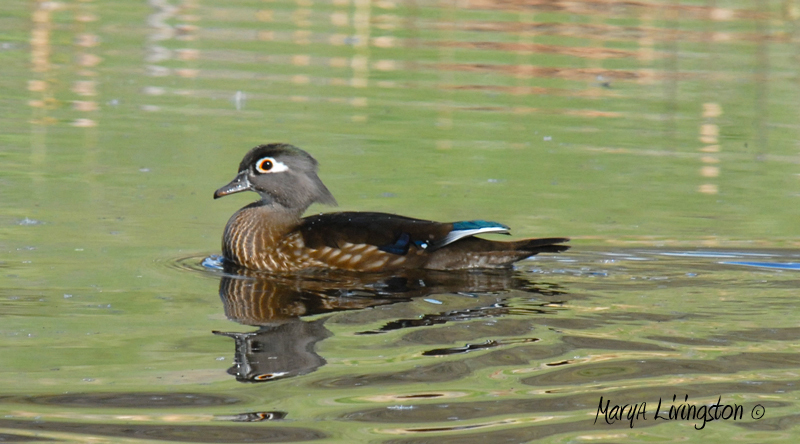 The wood ducks explore the trees often as we have a lot of hollow trees in our area. The turkey vultures start nesting in late February, so they get first dibs. 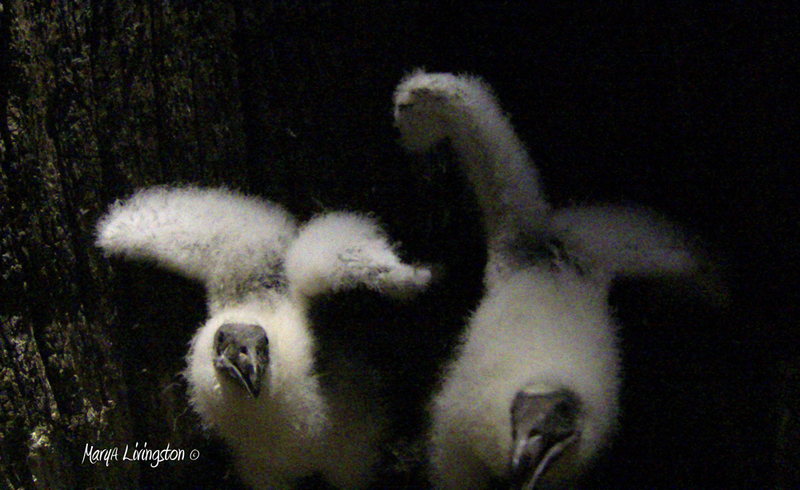 I may have a few more tries to lower the GoPro before the chicks start working on their climb out. Wish I could capture that climb! So cool – love being able to watch the babies grow, cute as cute is. Gosh it’s amazing what they have to do survive. …and they are so unappreciated doing it! Pure gold! They actually hiss? Yes, they hiss. Turkey vultures do not have a voice box like other birds. They can only grunt and hiss. Pretty good at it too! If you listen to Eerie Sounds from the Vulture Nest you can really hear them. I have one of an adult hissing at a hidden (not so hidden) camera. that is such a great video! the music is fun as well! the ironic part about the music, is that with the slow connection, a short youtube often takes fifteen or twenty minutes to load/play. i forgot and prompted it to start, and it did fine until second 19 when it came to an abrupt halt. play yours until that moment, and see if it is as ‘perfect’ as it seemed here! i was wrong.. it was at 29 seconds! it took this long to get it go replay, but at least i have internet! ah, the moment when she dives in! I adjusted the timing for the drop of the camera in the GoPro sound track to coincide with the drop of the duck. I have no clue what she was thinking. Perhaps she was just curious! I know I am! I am glad you like the video, I had a blast making it. it was great, and your love for those birds comes through. i think they’re lovely ducklings!!!! They are such a happy distraction with their fluffy feathers and gray faces. I am going to lower the GoPro with the vented back, should get better hissing. I just hope they don’t vomit on it. I loved the video. 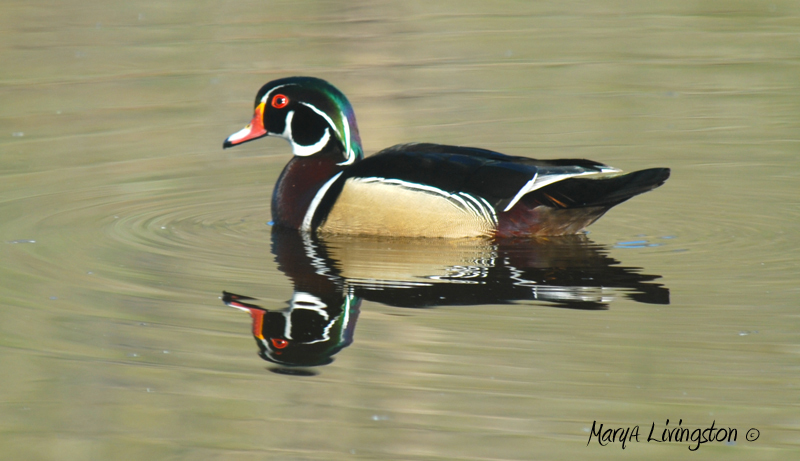 Wood Ducks are beautiful, aren’t they? Your paintings of them are wonderful. Thanks for always sharing fun things. I saw you great post on 50K reads… congrats! Oh! This video is so great!! When that duck came out it looked like she was sure telling somebody off or something! Those “chicks” are sure getting big. One of our family princesses used to have a dog costume that looked just like them! I love your videos. Can’t wait to see them try to get out of that tree! Me too. Love the bit about the family princess costume. And I must say, since you called them “ghost babies” they are just a little more endearing. Soon they won’t look like this. They are already starting to get their grown up feathers. I noticed what looked like black feathers coming thru that fluff. and Hey! Thanks about the book! I hope Jake and the kids like it!